Zakynthos (Greek: ) or Zante ( from Venetian) is a Greek island in the Ionian Sea. It is the third largest of the Ionian Islands. Zakynthos is a separate regional unit of the Ionian Islands region, and its only municipality. It covers an area of 410 km2 (158 sq mi) and its coastline is roughly 123 km (76 mi) in length. The name, like all similar names ending in -nthos, is pre-Mycenaean or Pelasgian in origin. In Greek mythology the island was said to be named after Zakynthos, the son of a legendary Arcadian chief Dardanus. Zakynthos is a tourist destination, with an international airport served by many charter flights from northern Europe. The islands nickname is To fioro tou Levante (Italian: , English: The flower of the East), given by the Venetians. Zakynthos was inhabited from the Neolithic Age, as some archaeological excavations have proved. The ancient Greek poet Homer mentioned the island in the Iliad and the Odyssey, stating that the first inhabitants of it were the son of King Dardanos of Troy called Zakynthos and his men. In mythology the island was then conquered by King Arkesios of Kefalonia, and then by Odysseus from Ithaca. Later on, a treaty was signed that made Zakynthos an independent democracy, the first established in Greece, that lasted more than 650 years. The Athenian military commander Tolmides concluded an alliance with Zakynthus during the First Peloponnesian War sometime between 459 and 446 BC. The importance of this alliance for Athens was that it provided them with a source of tar. Tar is a more effective protector of ship planking than pitch (which is made from pine trees). The Athenian trireme fleet needed protection from rot, decay and the teredo, so this new source of tar was valuable to them. The tar was dredged up from the bottom of a lake (now known as Lake Keri) using leafy myrtle branches tied to the ends of poles. 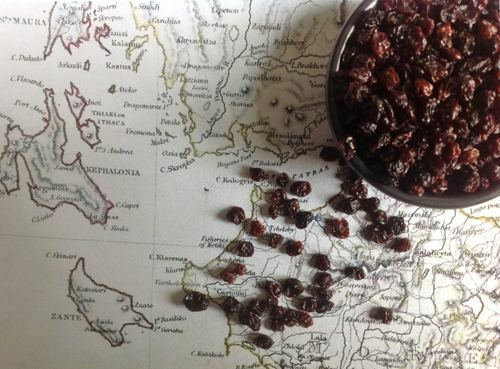 It was then collected in pots and could be carried to the beach and swabbed directly onto ship hulls. Alternatively, the tar could be shipped to the Athenian naval yard at the Piraeus for storage. Zakynthos lies in the eastern part of the Ionian sea, around 20 kilometres (12 miles) west of the Greek (Peloponnese) mainland. 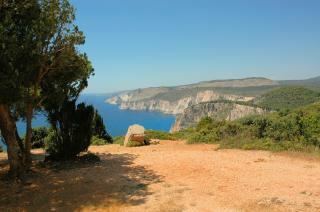 Island of Kefalonia lies 15 kilometres (9 miles) on the north. It is the southernmost of the main group of the Ionian islands (not counting distant Kythira). Zakynthos is about 40 kilometres (25 miles) long and 20 kilometres (12 miles) wide, and covers an area of 410 km2 (158 sq mi). Its coastline is approximately 123 km (76 mi) long. According to the 2011 census, the island has a population of 45,650. The highest point is Vrachionas, at 758 m.
Zakynthos has the shape of an arrowhead, with the "tip" (Cape Skinari) pointing northwest. The western half of the island is a mountainous plateau and the southwest coast consists mostly of steep cliffs. The eastern half is a densely populated fertile plain with long sandy beaches, interrupted with several isolated hills, notably Bochali which overlooks the city and the peninsula of Vasilikos in the northeast. The peninsulas of Vassilikos on north and Marathia on south enclose the wide and shallow bay of Laganas on the southeast part of the island. The capital, which has the same name as the prefecture, is the town of Zakynthos. It lies on the eastern part of the northern coast. Apart from the official name, it is also called Chora (i.e. the Town, a common denomination in Greece when the name of the island itself is the same as the name of the principal town). The port of Zakynthos has a ferry connecting to the port of Kyllini on the mainland. Another ferry connects the village of Agios Nikolaos to Argostoli on Kefalonia. Minor uninhabited islands around Zakynthos included in the municipality and regional unit are: Marathonisi, Pelouzo, Agios Sostis in the Laganas bay; Agios Nikolaos, near the eponymous harbor on the northern tip; and Agios Ioannis near Porto Vromi on the western coast. The island has a long musical tradition. It was a precursor of opera and operetta in Greece and on the island it constituted links between nobles and the rest of the people. In 1815 it saw the establishment of the first Music School in Greece. During the first Olympic Games (Athens 1896), the Music Band of Zakynthos took part in the event. It was the period when composers of Zantiote origin, such as Domeneginis Kapnissis, enjoyed some fame in Europe. Inaugurated in 2009, Zakynthos also now has its own Zante Jazz Festival. 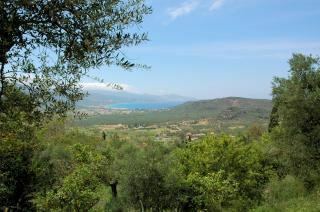 The novel Among the Olive Groves by Chrissie Parker is primarily set on the island of Zakynthos. There are two museums located in Zakynthos town: the Byzantine Museum of Zakynthos, featuring renaissance paintings, Byzantine icons and more; and the Museum of Solomos and Eminent People of Zakynthos, hosting the mausoleum of Dionysios Solomos and Andreas Kalvos, as well as works by many eminent Zakynthians. Common sweets, often found in the Ionian islands, are pasteli and mandolato.